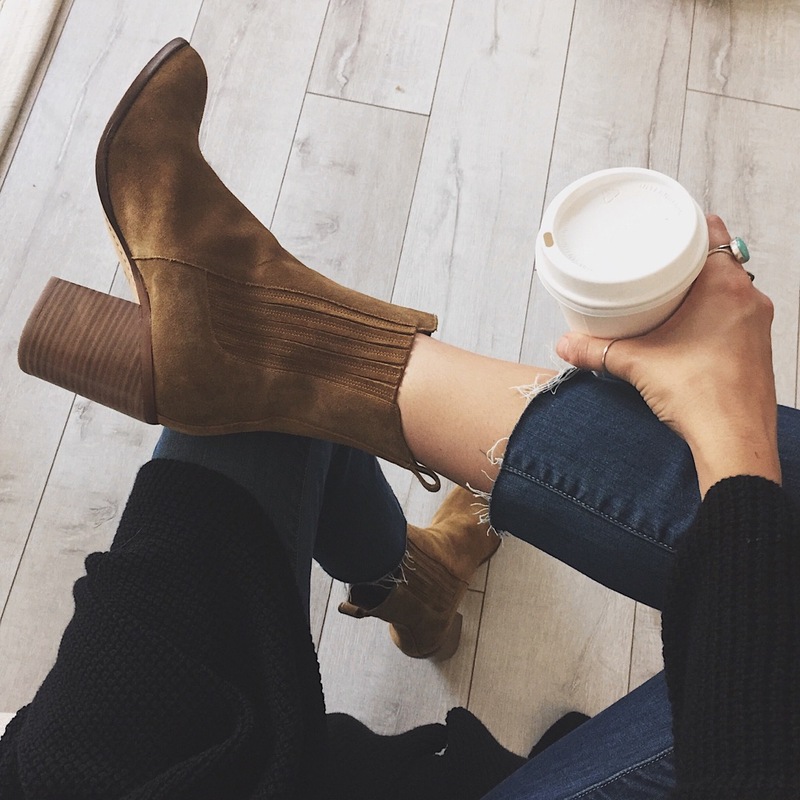 What else is there to do on a gloomy Wednesday then to put on your cute new boots and get a coffee. This morning was perfect- nice and cool with the gloom lingering over. I was craving the spiced chai from the Ebar at Nordstrom (so good if you haven't tried it) I finally got to whip out this sweater and not sweat in it... people watched a bit and then headed home. It was so calm and relaxing just what I needed. This sweater is only $88 and by this new brand I came across Azalea. If you've been on the hunt for the perfect oversized black sweater with kimono sleeves then this will be perfect for you! 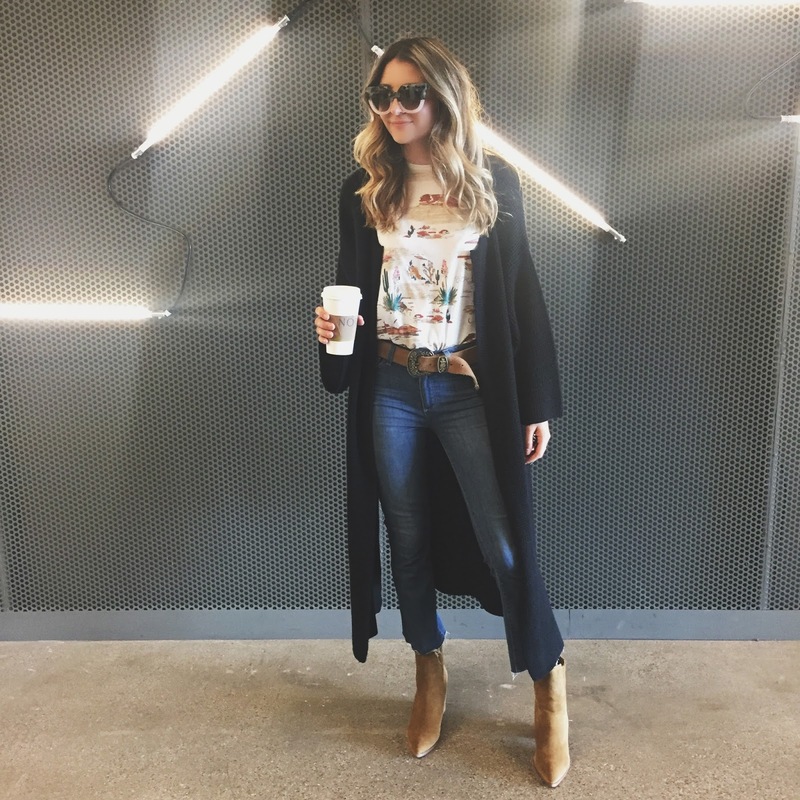 The jeans are by Paige- and they are the colette crop flare style. I thought it was perfect to wear the crop flare with my new booties by Marc Fisher. Im so obsessed with these suede beauties. The heel makes me about 6 feet tall but I'm ok with it. (husband not so much, but I don't dress for him- sorry babe) They are also surprisingly comfortable (and I even have blisters on my heel from a different shoe I wore the prior week) so totally winning in my book! The tee has a cute wild west print so of course I'm all about it. Paired with the perfect belt from Free people.